With web analytics software, you can watch the behavior of your site’s visitors, but you can also find out a lot by monitoring mentions of you, your blog, and your topic on the web (especially on your competitors’ blogs!) on other websites. Watching what’s going on within the blogosphere is a huge task. You can spend hundreds of dollars to have others do it for you, or you can check out some of the simple tools available on the web. E-mail notifications: Receive updates via e-mail about content or topics that you want to keep up with. RSS watch lists: Keep current on topics by using your favorite newsreader software. You can use these tools in a variety of ways by doing random manual searches and installing software designed to display web information on your desktop. The power of RSS and the syndication of news and blog feeds become apparent when you start trying to monitor certain phrases and keywords. RSS is one of the best ways to track what people are saying about your blog and about topics that you’re interested in. Google Alerts provides you with e-mail notifications that it sends to you based on keyword searches of Google’s search system. Sign up for an account and then create an alert by entering keywords to be notified about. Enter the keywords that you want to be notified about in the Search Terms text box. Select the type of web content that you want included in your search from the Type drop-down list. Your options are Everything, News, Blogs, Video, Discussion, and Books. Select how often you want to be notified from the How Often drop-down list. You can select As-It-Happens, Once a Day, or Once a Week. Choose the quantity of results you want from the Volume drop-down list. Your options are Only the Best Results and Everything. Type your e-mail address into the Your Email field or select Feed. If you are already signed into your Google account, your Gmail address is automatically filled in. If you select Feed, you can subscribe to these custom search results using an RSS reader. Google begins to track your search and sends you the e-mails that you requested at the rate you want them. When a keyword gets a hit, you get an e-mail that includes a link to the web page. Google Alerts can do automatic keyword searches for all kinds of websites, including blogs. These alerts work best when you create a specific and detailed search. Think about how you can refine your search to keep your results to a manageable number. For instance, if you want to track a particular news topic, use several keywords rather than just one. For example, use , not just . 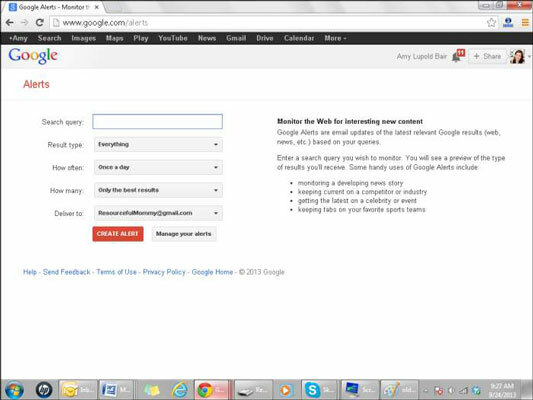 Set Google Alerts to search for your name, your blog name, and any keywords that you want to be aware of. Use these alerts to find out when people are talking about you, your blog, or the topics you’re covering. Twitter is a social-networking service that allows you to post online messages known as tweets. People can then watch your tweets, and you can watch theirs. Your tweets can be anything, from short messages to links to websites or conversations with others. You can also use Twitter to track what people are talking about by searching for keywords and hashtags (Twitter users sometimes mark keywords in their tweets with a # to set them off and make it easier to search for them). You can search using the Twitter search engine at the top of the screen on www.Twitter.com.